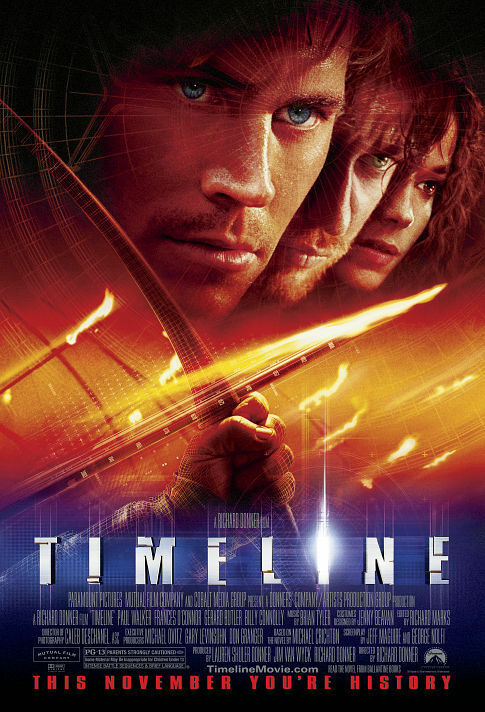 Timelineis a 2003 screen adaptation of Michael Crichton’s 1999 sci-fi novel of the same name. Directed by Richard Donner and starring a cast of well-known actors, including Paul Walker, Gerard Butler, and Billy Connolly, the film has been received by the viewers as an averagely entertaining film, but according to critics is incoherently plotted, clunky, and an unwanted addition to the cheesy time-travel genre of sci-fi movies. It did poorly at the box office, grossing only 43 million dollars worldwide for a film with a budget of 80 million dollars. In sum, Timeline is a pale imitation of the genius of Michael Crichton’s bestseller. The film is about a group of archeologists who time travel back to the Hundred Years’ War to rescue their colleague in the middle of a massive battle between the forces of France and England. The group had been having unprecedented success with their excavation of the medieval village of Castleguard (the location of a massive battle in which France triumphed over England) because of the information being given to them by their sponsor company, the ITC Corporation. Fearing that the company tampered with the site, Professor E. A. Johnston goes to confront the company. Two days later, his students discover his prescription eyeglasses and a message written by him buried in the ruins of a monastery that has been sealed for 600 years. His students then travel to ITC, only for the company President Robert Doniger to reveal that in the process of trying to develop the technology for teleportation, they tapped into a wormhole in spacetime that leads to April 4, 1357. They are then informed that the professor is trapped in the fourteenth century on the eve of a great and destructive battle in the very place they were excavating. The four of them travel back to save him, unknowingly getting stuck when the time machine is damaged. Now it is a race against time for them to find the professor and escape before the wormhole closes and they are stranded in the past. The five time travelers are separated and reunited at multiple times in the film, meddling with history and the course of events, culminating in one of them, Andre Marek (Gerard Butler), staying in the past to marry the sister of the French leader, Lady Claire (Anna Friel), while the survivors of the group return to modern times. Timeline has been criticized for being historically inaccurate. None of the events or locations are real. There was no village of Castleguard and there was no Castle La Roche, much less a great battle between two massive armies at these places. It wasn’t even filmed in an authentic location. Almost the entirety the movie was filmed in Canada with a single scene being shot in Prague. The village, monastery, and castle were all built in or created through CGI technology. The historical figures within the film are completely fictitious as well. The entire battle was based on events that took place an entire century earlier and on the other side of France: the Siege of Chateau Galliard. The battle even has similar events, with the French tunneling into the fortress of Galliard just as they did to La Roche. However, for all its inaccuracies, Timeline did do a good job in its action scenes and staying true to the themes of the book. For example, in Crichton’s novel, the president of ITC, Doniger, is obsessed with the company being able to create a completely accurate re-creation of medieval France to sell to the public as a theme park. In the movie, the greed of Doniger is again expressed when he wants to give up on trying to repair the time machine as it might kill the archeologists on their return trip and tarnish the reputation of ITC. The action scenes of Timeline are also a cut above the rest. The director Richard Donner was against the use of CGI for the film, instead choosing to hire medieval re-enactors for the battle scenes. Needless to say the fights were the one bit of the movie that critics approved of. 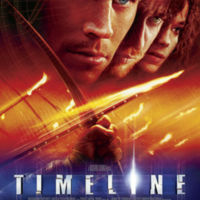 Michael Esposito, “Timeline (2003),” Medieval Hollywood, accessed April 24, 2019, http://medievalhollywood.ace.fordham.edu/items/show/125.